· Use the Pythagorean Theorem to find the unknown side of a right triangle. · Solve application problems involving the Pythagorean Theorem. A long time ago, a Greek mathematician named Pythagoras discovered an interesting property about right triangles : the sum of the squares of the lengths of each of the triangle’s legs is the same as the square of the length of the triangle’s hypotenuse . This property—which has many applications in science, art, engineering, and architecture—is now called the Pythagorean Theorem . Pythagoras studied right triangles, and the relationships between the legs and the hypotenuse of a right triangle, before deriving his theory. If a and b are the lengths of the legs of a right triangle and c is the length of the hypotenuse, then the sum of the squares of the lengths of the legs is equal to the square of the length of the hypotenuse. In the box above, you may have noticed the word “square,” as well as the small 2s to the top right of the letters in . To square a number means to multiply it by itself. So, for example, to square the number 5 you multiply 5 • 5, and to square the number 12, you multiply 12 • 12. Some common squares are shown in the table below. Let’s try out all of the Pythagorean Theorem with an actual right triangle. This theorem holds true for this right triangle—the sum of the squares of the lengths of both legs is the same as the square of the length of the hypotenuse. And, in fact, it holds true for all right triangles. The Pythagorean Theorem can also be represented in terms of area. In any right triangle, the area of the square drawn from the hypotenuse is equal to the sum of the areas of the squares that are drawn from the two legs. You can see this illustrated below in the same 3-4-5 right triangle. Note that the Pythagorean Theorem only works with right triangles. You can use the Pythagorean Theorem to find the length of the hypotenuse of a right triangle if you know the length of the triangle’s other two sides, called the legs. Put another way, if you know the lengths of a and b, you can find c.
In the triangle above, you are given measures for legs a and b: 5 and 12, respectively. You can use the Pythagorean Theorem to find a value for the length of c, the hypotenuse. Substitute known values for a and b. The square root of 169 is 13. Using the formula, you find that the length of c, the hypotenuse, is 13. Finding a square root takes some practice, but it also takes knowledge of multiplication, division, and a little bit of trial and error. Look at the table below. It is a good habit to become familiar with the squares of the numbers from 0‒10, as these arise frequently in mathematics. If you can remember those square numbers—or if you can use a calculator to find them—then finding many common square roots will be just a matter of recall. For which of these triangles is ? Incorrect. 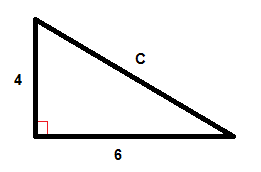 This is not a right triangle, so you cannot use the Pythagorean Theorem to find r. The correct answer is Triangle B. Correct. This is a right triangle; when you sum the squares of the lengths of the sides, you get the square of the length of the hypotenuse. You can use the same formula to find the length of a right triangle’s leg if you are given measurements for the lengths of the hypotenuse and the other leg. Consider the example below. Find the length of side a in the triangle below. Use a calculator to estimate the square root to one decimal place. In this right triangle, you are given the measurements for the hypotenuse, c, and one leg, b. The hypotenuse is always opposite the right angle and it is always the longest side of the triangle. 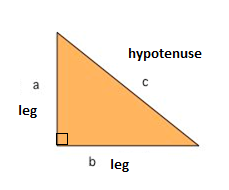 To find the length of leg a, substitute the known values into the Pythagorean Theorem. Solve for a2. Think: what number, when added to 36, gives you 49? Which of the following correctly uses the Pythagorean Theorem to find the missing side, x? Incorrect. In this triangle, you know the hypotenuse (the side opposite the right angle) has a length of 10. The lengths of the legs are 8 and x. The correct answer is . Incorrect. The Pythagorean Theorem is a relationship between the lengths of the sides squared. The correct answer is . Correct. In this triangle, the hypotenuse has length 10, and the legs have length 8 and x. Substituting into the Pythagorean Theorem you have: ; this equation is the same as , or . What number, times itself, equals 36? That would make x = 6. Incorrect. In this triangle, the hypotenuse has length 10 (always the longest side of the triangle and the side opposite the right angle) not 8. The correct answer is . The Pythagorean Theorem is perhaps one of the most useful formulas you will learn in mathematics because there are so many applications of it in real world settings. Architects and engineers use this formula extensively when building ramps, bridges, and buildings. Look at the following examples. The owners of a house want to convert a stairway leading from the ground to their back porch into a ramp. The porch is 3 feet off the ground, and due to building regulations the ramp must start 12 feet away from the base of the porch. How long will the ramp be? Use a calculator to find the square root, and round the answer to the nearest tenth. To solve a problem like this one, it often makes sense to draw a simple diagram showing where the legs and hypotenuse of the triangle lie. Identify the legs and the hypotenuse of the triangle. You know that the triangle is a right triangle since the ground and the raised portion of the porch are perpendicular—this means you can use the Pythagorean Theorem to solve this problem. Identify a, b, and c.
Use the Pythagorean Theorem to find the length of c.
Use a calculator to find c. The square root of 153 is 12.369…, so you can round that to 12.4. The ramp will be 12.4 feet long. A sailboat has a large sail in the shape of a right triangle. The longest edge of the sail measures 17 yards, and the bottom edge of the sail is 8 yards. How tall is the sail? Draw an image to help you visualize the problem. In a right triangle, the hypotenuse will always be the longest side, so here it must be 17 yards. The problem also tells you that the bottom edge of the triangle is 8 yards. 15 • 15 = 225, so a = 15. The height of the sail is 15 yards. The Pythagorean Theorem states that in any right triangle, the sum of the squares of the lengths of the triangle’s legs is the same as the square of the length of the triangle’s hypotenuse. This theorem is represented by the formula . Put simply, if you know the lengths of two sides of a right triangle, you can apply the Pythagorean Theorem to find the length of the third side. Remember, this theorem only works for right triangles. One of the best known mathematical formulas is Pythagorean Theorem, which provides us with the relationship between the sides in a right triangle. A right triangle consists of two legs and a hypotenuse. The two legs meet at a 90° angle and the hypotenuse is the longest side of the right triangle and is the side opposite the right angle. There are a couple of special types of right triangles, like the 45°-45° right triangles and the 30°-60° right triangle. Because of their angles it is easier to find the hypotenuse or the legs in these right triangles than in all other right triangles. 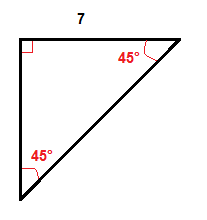 In a 45°-45° right triangle we only need to multiply one leg by √2 to get the length of the hypotenuse. We multiply the length of the leg which is 7 inches by √2 to get the length of the hypotenuse. To find a, we use the formula above.